The newly elected leader of Kensington and Chelsea Council has been booed and heckled amid continuing anger over the Grenfell Tower fire. 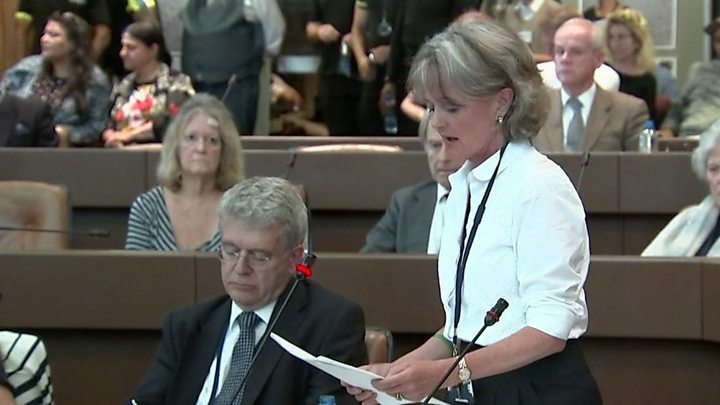 Protesters shouted "resign" and "shame on you" as Elizabeth Campbell was made council leader at a public meeting. The councillor said she was "deeply sorry" for the "grief and trauma" caused by the blaze in west London. About 70 of the 255 people who survived the blaze attended the meeting after condemnation of the council's response. At least 80 people are dead or missing after the tower block fire on 14 June. The council has been accused of being slow to react on the ground and not doing enough to re-house Grenfell Tower residents. It was the first cabinet meeting since the fire, after the council abandoned an earlier meeting - which had been planned as a closed one - when members of the press were allowed in after a High Court judgement. Addressing survivors in the chamber, Ms Campbell said: "I am truly sorry that we did not do more to help you when you needed it the most." Former Grenfell Tower residents sat in the public gallery, while at least 150 community members and volunteers were in an overspill room. One by one, residents and those who lost loved ones gave accounts of their traumatic experiences, voicing their distrust in local services. One survivor, from the 16th floor of Grenfell Tower, who gave his name as Hamid, said he had "had enough". "I need a place to go and start my life," he said. "I'm not asking for something big. "We need to move on. We want to go to work - kids got to go to school." Another survivor told the chamber he had been living in a hotel room since the fire, with just one double bed between him, his wife and three children. He said that the residents' main problem was a lack of action. "I was forgotten about," he added. "You know who has done something for us? The residents of North Kensington. Our community. Our neighbours." As the meeting progressed, attention turned to a petition calling for the council's entire elected leadership to resign. It was signed by more than 1,500 people, passing the threshold for a debate by councillors. Labour's newly elected MP for Kensington, Emma Dent Coad, said: "I agree entirely with the petition's demands." Ms Campbell, who was heckled again as she responded to the petition, said: "We will not continue business as usual and we will rebuild trust, as I said, brick by brick." Earlier, she said 68 new homes for Grenfell Tower survivors would be identified and bought within the next two weeks, and an additional 31 homes would be acquired in the next few weeks. The councillor also promised that 400 new social houses would be built over the next five years. She took over as de facto leader after Nicholas Paget-Brown resigned on 30 June. She later admitted on the Today programme that she had never been in a tower block, but added that she had visited many council houses. A group of demonstrators stood outside Kensington Town Hall during the meeting holding Justice for Grenfell placards.